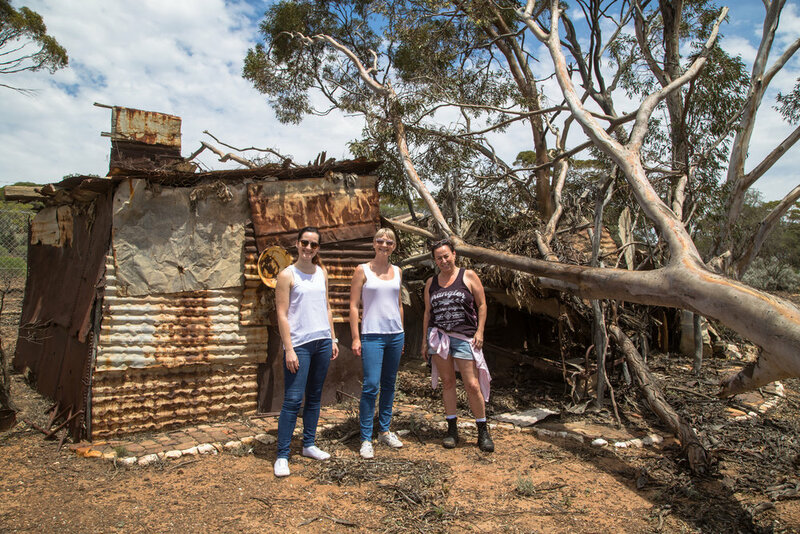 The Gold Industry Group were recently treated to the ultimate one day road trip through the Goldfields by Mandy and Chuck from the Goldfields Tourism Network WA. 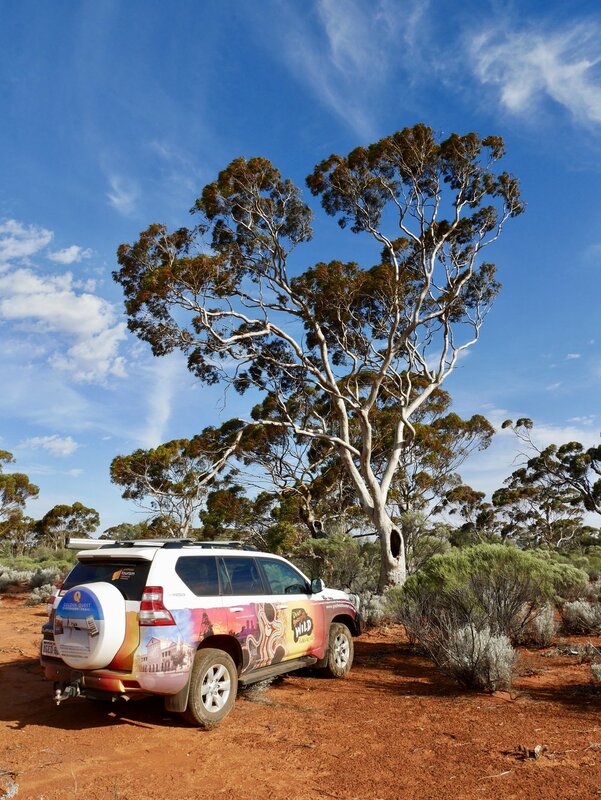 The 300 km long photo-shoot included several hidden gems and journeyed to key stopping points on the Golden Quest Discovery Trail – an epic adventure through the heart of the region. Jumping into the 4x4 chariot we set out from the City of Kalgoorlie-Boulder to our first stop, the hideaway camp of famous gold prospector Jack Carin (1). Affectionately named Breslen, the tin shack still stands today and was built by Jack himself from bits of timber, corrugated iron and other materials he found while exploring the surrounding bush. Jack was well known for riding his bicycle along the railway into town to collect supplies and lived in his humble abode util the 1980s. 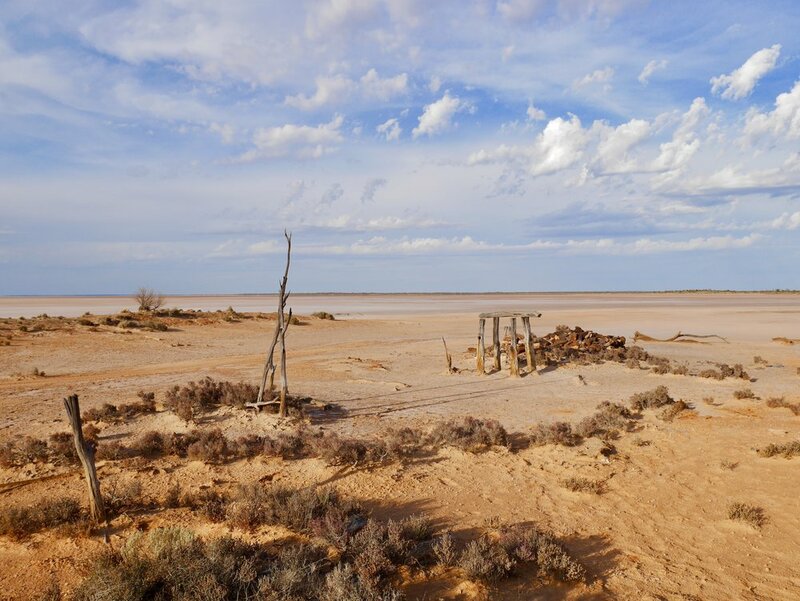 From Jack’s camp it was onwards to the ‘Mother of the Goldfields’ (2), the town of Coolgardie, and the site of Arthur Bayley and William Ford’s gold discovery in 1892 which sparked one of the nation’s biggest gold rushes. Along the way Mandy and Chuck regaled us with tales of historic finds, local legends and a few secret tips. After locating the historic Warden’s Court Building, we visited Warden Finnerty’s Residence – now managed by the National Trust. 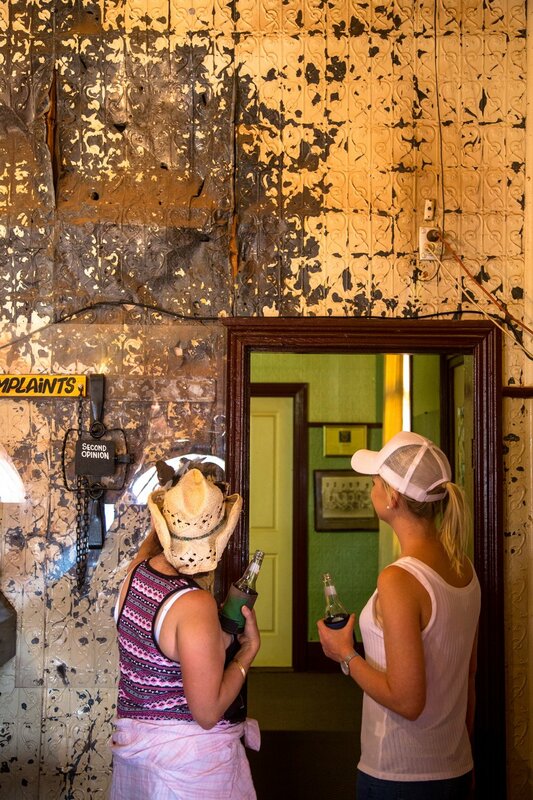 Commonly know as The Residency and built in 1895, it is the original home to the first magistrate of the Coolgardie Goldfields John Finnerty. In order to discover Kunanalling (3) and the ruins of the Premier Hotel, our guides traversed some awe-inspiring countryside that took us through much of the Great Western Woodlands. 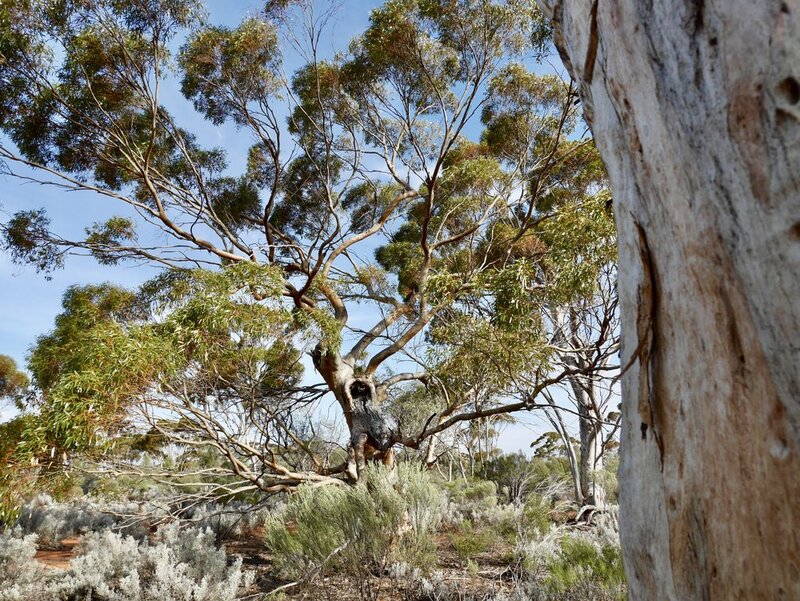 This famed patch of Australian bush is an eco-diversity wonderland with more than 20% of Australia’s flowering plant species and 30% of Australia’s Eucalyptus species found here – making it a highly significant bioregion. In 1895 gold was discovered in the area and the town was gazetted in 1896. The Premier Hotel, whose walls still largely remain, was rumoured to be the first pub in Australia to serve over the counter meals. 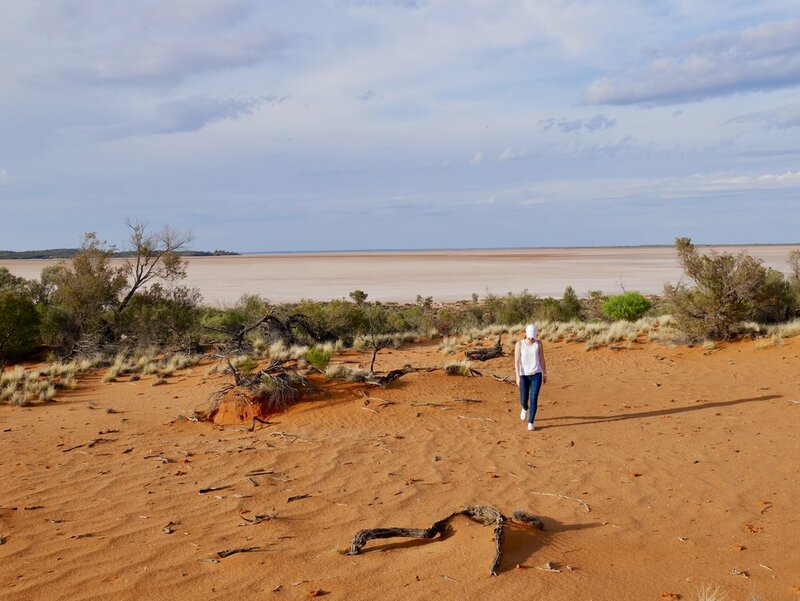 Travelling further along the Coolgardie North Road, we came upon Rowles Lagoon (4), a large freshwater lake cocooned in the bush and in stark contrast to its red outback surrounds. As the only freshwater wetland within the Goldfields region, the reserve is a vital source of water for the animals of the area, including some 40+ species of birds. Our lunch stop was to be at Ora Banda (5), home of the renowned Ora Banda Inn. The pub famous for its bikie history and subsequent bombing in the early 2000’s is only a small part of the town’s history. In 1893 gold was first discovered and the claim named Ora Banda, which is Spanish for “Band of Gold”. After being treated to a scrumptious plate of authentic fare we set out again in direction of a unique site Mandy insisted we see in Siberia (6). The prospectors who found the first gold here were Billy Frost and Bob Bonner. They brought 40 ounces of gold into Coolgardie in October 1893 and applied for a claim. This caused a rush of diggers to the location. Authorities warned these men that they were taking grave risks going out into dry country, but the lure of gold was too strong to stop them. Here a thriving Bougainvillea stands alone in the scrub. The beautiful tree was planted in memorial to a lost child and its blooming branches have been tenderly looked after by locals and visitors alike for over 100 years, with bottles of water stashed at its base in times of drought and a log book full of kind messages for travellers to uncover. Nearby we located the grave site of the unfortunate child and of other residents during the days of the gold rush. Leaving the tarmac behind, our off-road expedition took us out bush again on beaten paths through the Goongarrie (7) conservation park where our destination was a large salt lake housing an uninhabited island. 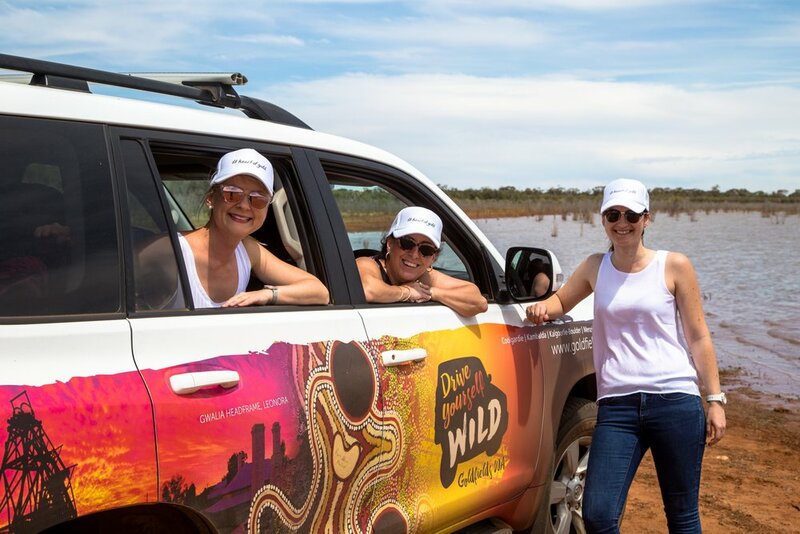 We visited the island located on the reserve and just getting there is one way you can ‘Drive Yourself Wild’ in the Goldfields. Whilst traversing the vast natural environment, we learnt the island and its causeway were built to service a desalination plant to provide fresh water. The tank stand can still be seen on the island by the lake’s edge as well as remnants of prospectors and sandalwood cutters camps. Before long we found ourselves back on the road heading south to Broad Arrow (8), and its movie-famous pub the Broad Arrow Tavern, for a refreshing drink as the sun set on our experience. The local Aboriginal people called this area 'kurawah'. Originally gazetted Kurawah in 1896, it was changed to Broad Arrow in 1897 after a Irish prospector left Kalgoorlie marking trees along the route with a number of broad arrows for his nephew to follow. 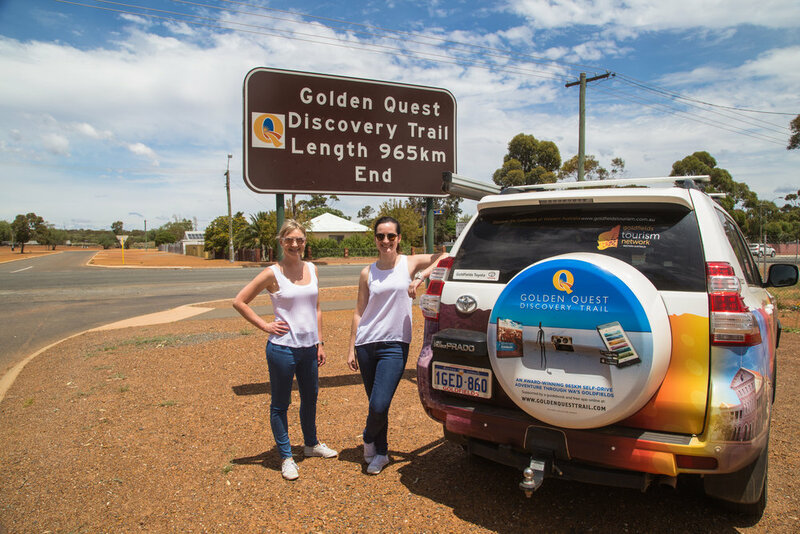 The Golden Quest Discovery Trail can be completed using either the Guidebook or the Golden Quest Trail app (available from iTunes and Google Play). 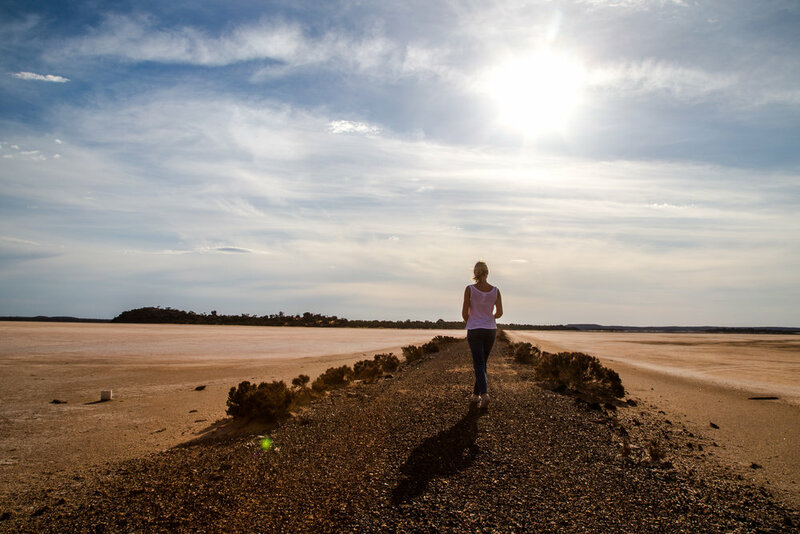 Some of the above locations feature as Points of Interest within the Heart of Gold Australia app (also available from iTunes or Google Play), or continue your adventure on the Kalgoorlie #heartofgold Discovery Trail.